The role of the ‘chief marketing officer’ is one that evades a clear definition. While most of the executive leaders with the title agree they’re responsible for customer experience, how they go about achieving this, and the tools, organisational cultures and management techniques at their disposal, can be as different as chalk and cheese. The CMO’s importance and relationships with the rest of the c-suite also vary, twisting and turning with the business tide. For the CMO of business consulting and financial advisory group Deloitte Australia, David Redhill, the need to hold skills in multiple disciplines, and wear different hats, is something he’s well-accustomed to. Redhill should know. As the CMO of Deloitte Australia for the past 10 years, he has been instrumental in orchestrating transformational change in how the company operates, as well as the perception of its brand both by customers and potential employees. Redhill’s background is as varied as his views on the marketer’s role. Starting out as a poet and short story writer at school, he completed a communications degree and looked to forge a career in journalism while maintaining his interests in photography and music. Redhill’s first position after graduating was with mainframe computing company, ICL Computers, covering PR and communications. An early assignment was running a campaign around ICL’s introduction of barcode scanning in Australia with worldwide test pilot, Woolworths. “It was at a time when we were getting word processors on desks for the first time and networked communications,” he said. Redhill opted to then travel through Southeast Asia as a freelance journalist and photographer before spending two years in Spain, then relocating to London. He became European communications editor for PriceWaterhouse’s corporate publication and helped launch desktop publishing across the business. “Working in a professional services environment was a fantastic way of accessing a microcosm of every aspect of business, government and society,” he said. A hard right turn saw Redhill switch to agency land with Landor Associates, one of the world’s leading corporate identity consultancy groups that spearheaded the rise of brand design thinking. Redhill attributes his success there to his ability to articulate the role of branding for businesses combined with design principles. “I quickly built a reputation for Landor and myself as pushing the branding concept, and explaining the complexity and value of branding as an important and strategic business discipline,” he said. That experience led to a year-long project with the Financial Times producing the first European-wide study on branding design in consumer goods. Redhill then became the worldwide head of marketing and communications at Landor Associates in San Francisco where he launched the first brand research tool, Image Power. For two years afterwards, Redhill rode the dotcom rollercoaster with several start-ups before being recruited to Deloitte Consulting, which was looking to split its consulting and auditing businesses following the collapse of Enron and regulatory changes imposed by the US Security and Exchange Commission. The spin-off didn’t happen, but Redhill stayed on to devise the reunified global brand strategy for Deloitte. 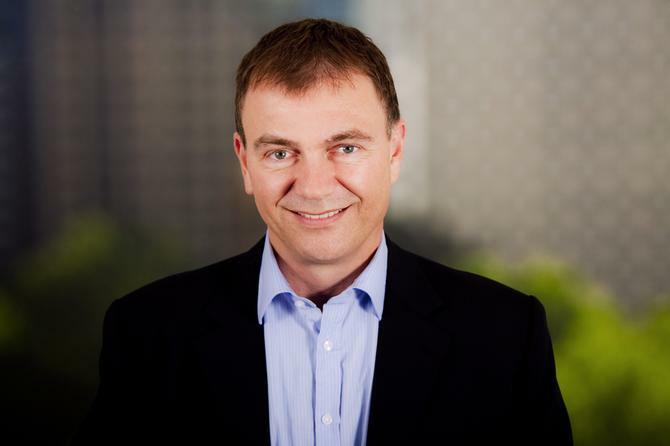 Since 2003, Redhill has been the CMO at Deloitte in Australia and at the forefront of the group’s transformation strategy. He has earned several accolades for his creativity through initiatives such as the award-winning Green Dot advertising campaign, and was recognised by the Australian Marketing Institute as Certified Practising Marketer of the Year in 2011. Deloitte’s $30,000 Fantasy Football program, which combined emerging social media strategy on a global level with brand communication, was also awarded best internal marketing campaign in the same year. One of cornerstones of Deloitte’s makeover from ailing group to one of the top four accounting groups worldwide has been social networking and collaboration. Redhill claimed the organisation changed the way it manufactures ideas by employing social tools internally, and via a range of socially engaging activities for employees. “How do you get the best ideas out of the business? You don’t leave it to 5 per cent of the directors who are most experienced, especially in an area of digital change. You look to people who have grown up in the digital age and who think differently,” he said. “Our product is people and ideas. The only way we can differentiate ourselves and succeed in the long term is through three things: By the way we lead people and help them realise their potential inside the business; by the culture we create; and by the strength of the relationships we have with clients. Measurement is an important part of any social media effort, and at Deloitte this also plays a role in understanding and acting on client behaviour. For example, the businesses analyses the traffic of social media conversations between service clients and has been able to demonstrate that at certain times in the economic cycle, there is a lot more conversation between consultants and corporate financiers, or risk experts and auditors. “Those are tangible measures like revenue, how our customers are doing, market share, and the softer measures like what’s our level of employee engagement, how many people want to work here at Deloitte?” Redhill continued. However, he stressed measurement shouldn’t get in the way of true engagement. As social media matures, Redhill claimed it will become the natural way of doing business, discovering new communities, seeking feedback and engaging people in process, much like the Internet. “So many businesses say people are our most valuable resource. Social media is the way of demonstrating that by harnessing collective wisdom and getting people to help you create the solution,” he said. “We just want to get better and better at that, tying people into every business process whether it’s product development, audience segmentation, identifying opportunities, brainstorming wicked problems without simple solutions, or using social media to foment a strong culture and sense of connectivity and belonging. Like other CMOs, Redhill has had to constantly re-evaluate his position, as well as the role of marketing within an organisation. His view is that the marketing discipline is following IT from the fringes of the business to its centre. To truly achieve a customer-centric approach, Redhill said a CMO needs a great CEO who recognises that they are ultimately the brand champion and chief marketer of the business. At Deloitte, Redhill and his CEO do each other’s jobs and make each other’s ideas better, he added. Likewise, CMOs need to work more closely with their CIOs in helping their businesses succeed. “We are in each other’s pockets, doing each other’s job, just as I do with the head of HR. Increasingly, there are blurring job descriptions. While he may have spent 10 years with Deloitte, Redhill believes his role has and continues to evolve. “I’ve been a creator, film script writer, visualiser, story boarder, strategic council to the executive, looked at product segmentation for different markets, covered PR and communications strategy, corporate governance and reputation, and looked at our culture and data,” he said. As an example of how different marketing leaders can be, he raised the legacy of the Commonwealth Bank’s outgoing CMO, Andy Lark with his predecessor, Mark Buckman. “I came into this place when we were a $330m business, going south and haemorrhaging money, with our reputation in the gutter,” Redhill continued. “Today, we’re a $1bn business. We have wowed the market in terms of our turnaround story, and we’re seen as an icon, innovator, and a business that is good to its people and an interesting place to work with and for. There have been 10 other incarnations of Deloitte along the way. “We have brought in elements like data analytics, digital, design thinking, Web and mobile application design, forensics, and woven new technology-based disciplines into traditional compliance and attest businesses like tax, audit, consulting. To effectively get across all that and help the business make sense of itself and to the market, you are drawing on a whole lot of disciplines. How could you ever get bored?